Get 5% cashback on SBI bank Credit Card EMI on purchase of Electronics, Mobile, Large Appliances, Cameras, Gaming Consoles Laptops, Sports, Fitness & Furniture. The minimum transaction amount to avail cashback is INR 12500. The maximum cashback per card across Amazon.in Site and App is Rs. 1500. Promotion valid from April 22, 2019 to April 24, 2019. Cashback will be posted by July 24, 2019. Shop on the Online Grocery Shopping Store from Amazon and Get Upto 30% Discount and Upto Rs 200 Cashback as Amazon Pay Balance. Get Rs 100 back on purchase of Rs 1500 and Rs 200 back on purchase of Rs 2500. Offer valid on orders placed on Amazon Pantry using Amazon Pay balance only. Offer is applicable only on Pantry orders paid entirely using Amazon Pay balance. If Amazon Pay balance is combined with any other payment method, the offer will not apply. Axis Bank Amazon Offer : This Amazon pantry Grocery sale offer is valid every weekend (Saturday and Sunday) from 00:00:01 hours on 4th April 2019 to 23:59:59 hours on 30th April 2019. Cashback will be credited in the form of Amazon Pay balance immediately after the items are dispatched. Akshaya Tritiya Amazon Offer is valid from 12th to 14th April, 2019. Amazon Super Value Day Offers April-May 2019 ! Cashback for Amazon Pay balance Offer will be credited directly to the eligible customers’ Amazon Pay balance account immediately after the first shipment is dispatched. Under the Amazon SBI offer, you will receive an instant discount on your purchase value at the time of check-out. Shop worth Rs 1500 or more using ICICI Debit Card or Credit Card or Netbanking and get 15% cashback, up to max cashback of Rs 600. Offer is applicable on products belonging to Super Value Day Store on Amazon.in or Amazon Pantry. Amazon Mobile App Contest ! 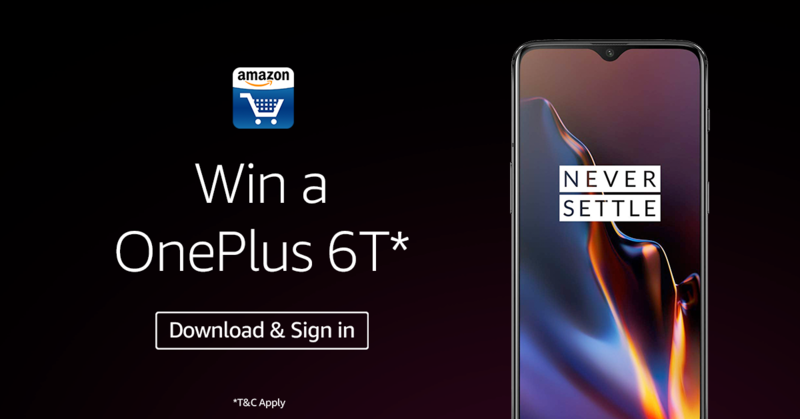 Sign In to stand a chance to win a OnePlus 6T* ! (1). This Contest will commence from March 23rd, 2019 at 12:00:01 a.m. (IST) and end April 23rd, 2019 at 11:59:59 p.m. (IST) (“Contest Period”). (2). In order to be eligible for the Contest, during the Contest Period you must: (a) download the mobile/tablet application of Amazon.in (“Amazon.in App”); and (b) thereafter, log-in/ sign-in to or sign-up from an account on the Amazon.in App. (3). At the end of the Contest Period, amongst all participants who undertake the actions stated in Section 2 above in accordance with these T&Cs, seven (7) participants will be selected by a random draw of lots to be eligible to answer the Contest question which they will receive from Amazon through an email. (5). Each participant will be eligible to receive only one Prize under this Contest. Get 10% cashback up to INR 100 on your first RuPay card transaction on Amazon. Offer Period March 29, 2019 to April 30, 2019 (both days inclusive). Get 10% cashback up to INR 25 using RuPay ATM card, debit card or credit card. offer period : March 29, 2019 to April 30, 2019 (both days inclusive).